When .NET Core was announced, the most exciting thing for me was always the fact I could host things I wrote in C# on Linux machines. The possibilities were huge! Then Docker came along, and being able to host containerised copies of my code interested me. Today I present how to quickly get a .NET Core WebAPI project up and running in Docker, and in this example - hosted on Heroku. Why would you want to do this, you ask? Maybe you want to test an idea, and Heroku is quite generous in their free hosting plans. When you build it on your machine, you can quite easily then push it to your host and know it will be exactly the same as your copy. Firstly, have you got .NET Core installed? If not, head on over to https://www.microsoft.com/net/download/ and grab the .NET Core SDK for your machine. These days you can do this on Windows, Linux or macOS which is fantastic! It will then generate you a basic HelloWorld ASP.NET WebApi project. Now if we look at the source for this project, we will see that there is a one controller called ValuesController. It will tell you the application has started on port 5000, so test it is running correctly by going to http://localhost:5000/api/values/. Now it is time to get our WebAPI project ready for Docker! If you don’t know what Docker is, read this article entitled What is Docker?. To get our WebAPI set up, we want to make sure we can specify what port to expose at runtime through a command line argument. This means we can now set the port upon load by passing through a urls parameter. Let’s quickly do that by loading up the project on port 12345. You will see the results at http://localhost:12345/api/values. 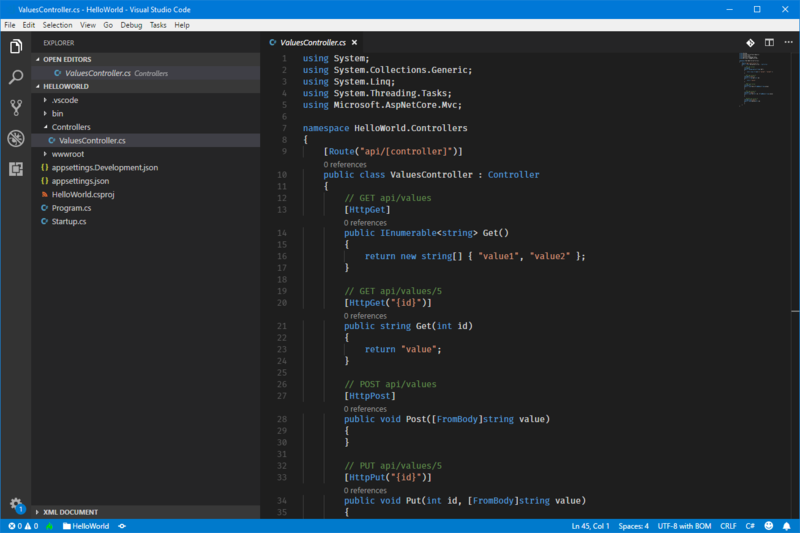 So we have our Web API ready, next up is getting it all packaged up in a Docker container. We will use a trick I have seen before - you set up a build image to do the compilation in, and then you do a runtime image to have only the things you need to run your application in. The benefit to this is you get a leaner image. CMD dotnet HelloWorld.dll --urls "http://*:$PORT"
It takes a litle while to get going if you have never done this before, but eventually after a bunch of stuff gets logged in your console you’ll end up with a message saying successfully built. Before we begin with Heroku - have you signed up to Heroku? If not, go sign-up for Heroku. Then, make sure you have the Heroku CLI installed from https://devcenter.heroku.com/articles/heroku-cli. We need this so we can set up our app and deploy from the command line. Woohoo! You will be given a randomised name for your app - for me I got protected-oasis-74796. Now we need to push our container. We will specify that the container we are using is designated to have a process type of web. Once that has been pushed, we can then release the image, meaning make it available to the web. If you have done this, you should now be able to access your WebAPI by the provided app’s url - for me it is now accessibile at https://protected-oasis-74796.herokuapp.com/api/values. Now you’re cooking with Heroku. You can download my code example from Github.